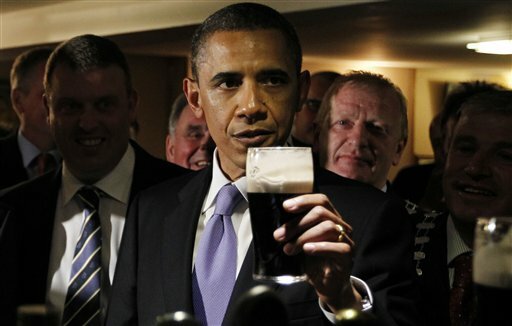 Obama in Ireland Gets Pint's Worth of Coverage in U.S. He came, he saw, he conquered? Obama, or O'Bama, captivated Moneygall, a youthful Dublin throng and most who watched it all on television or streamed online (thank you RTE! ), and it's no surprise he owned the front pages of Irish newspapers, including the Irish Times and the Irish Examiner, but to this stateside observer, U.S. media coverage was pretty light. Certainly a lot of other news clamored for attention, and not just the latest on The Schwarzenegger, Lady Gaga or Dominique Strauss-Kahn. The Joplin tornado was a major domestic disaster and media coverage rightfully wrapped around it. It did remind me a bit of the historic visit of Pope John Paul to Cuba. Remember that? Probably not so much, because as His Holiness was descending to the tarmac in Havana he was shunted off to the corner of the split screen as media attention shifted to breaking news about one Monica Lewinsky and another president with Irish connections. I wasn't scanning all the cable news all the time, but I didn't see much live coverage of the Moneygall visit, which really showed the president in a new and appealing light, though CNN went live with his rousing speech and Taoiseach Enda Kenny's impassioned oratory as well. NBC Nightly News based its Monday broadcast amidst the rubble in Joplin, Missouri and understandably most of the program was devoted covering that emerging tragic story. Still, I expected to see just a bit more of the Irish visit than two very quick clips which Brian Williams voiced over... incorrectly! There was a quick clip of Obama's speech and then the famous money(gall) shot of Obama drinking his pint, which Williams described as the obligatory pint of Guinness in the Dublin brewery. Don't shoot the messenger, he's just reading the copy. OK, not an earth-shaking gaffe, but, damn, the Moneygall Pint was probably the most covered and photographed event of Obama's visit. The president's second notable photo op involving a fermented hops and grain beverage (see Beer Summit), The Pint made the "Picture of the Day" at theatlantic.com and took the cover of Tuesday's Daily News. The New York Times ran a shot taken from the other side of the bar and though a thumbnail of The Pint did show up on nypost.com's homepage, to see the full image you had to click through 19 shots in the "Post Pics Today in Pictures" section, including a look at North Koreans sleeping on bags of fertilizer and an auto stunt driver in India, before getting to it. 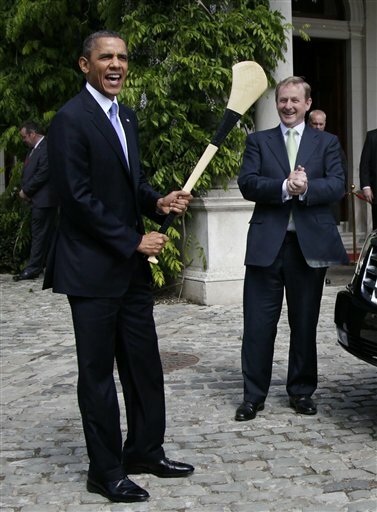 Online the Wall Street Journal also focused on the pub photo and threw in the other most popular image from the trip in "Obama Gets a Pint and a Hurling Stick." 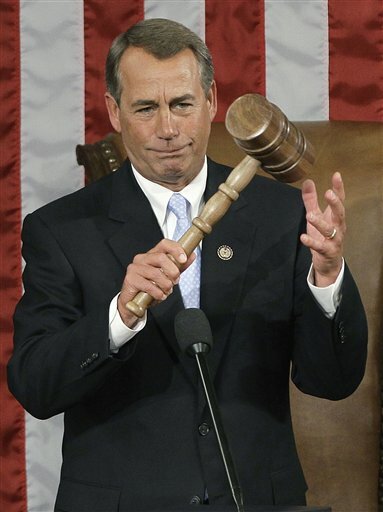 With the hurley, Obama has taken the lead in the arms race with John Boehner and his super-sized gavel. So what else got covered -- there was the pint, the hurley and... oh yes... Cadillac One bottoming out like a beached whale at the gates of the Embassy. You can see that right here at the Huffington Post here and almost everywhere. The serious subtext to Obama visit was noted of course, including the Obama's show of US support for an Ireland struggling to pull itself out of economic crisis, and his praise to all parties for the remarkable and unlikely path to peace they forged in Ireland, comments particularly notable in light of Obama's recent pointed remarks on the seemingly intractable issues in Israel and Palestine. Outside of the big play on the cover of the Daily News, front page coverage in the US of the president's Irish visit was hard to find today around the US. There wasn't anything on the front pages of New York Post or New York Times editions I saw. You can scan all the front pages collected daily by the Newseum and see if you find much of anything. An opportunity for Americans to see their president and Ireland in a new light was sideswiped by the more important news in Joplin and elsewhere, but in light of that kind of news, maybe blanket coverage of Obama far from home knocking back a pint of stout wouldn't have played so well. Anyway, Slainte Mr. President! As my grandfather was a Kearney, I'm considering us cousins until proven otherwise.